This interesting graph comes from a report published earlier this year by the Mexican Institute for Competitiveness (Instituto Mexicano para la Competitividad, IMCO). 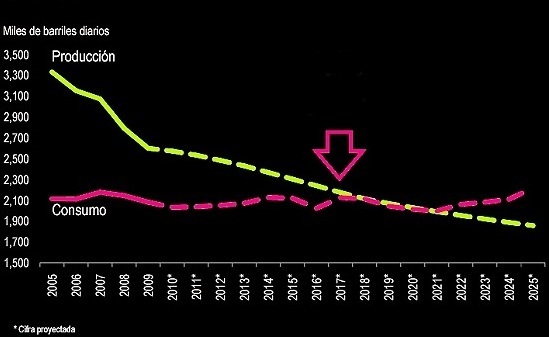 The purple line shows Mexico’s oil consumption in thousands of barrels/day from 2005 to 2009, with predicted values for the period 2010 to 2025. The yellow line shows Mexico’s oil production for the same period. Mexico's oil production (yellow) and consumption (purple), 2005-2025. Graph: IMCO. In which year is Mexico’s consumption of oil predicted to equal its production? What effects is this likely to have on Mexico’s economy? What factors might cause this date to occur earlier than predicted? What factors might cause this date to occur later than predicted?